The Dead Space trilogy is a lot like the Alien trilogy. The first one was focused on suspenseful horror, following the lead character as they are stalked through the halls of a mostly abandoned space ship by an unknown terror while desperately trying to escape. The second one was far more fast-paced, blasting your way through a fallen colony while fending off hordes of nightmares. 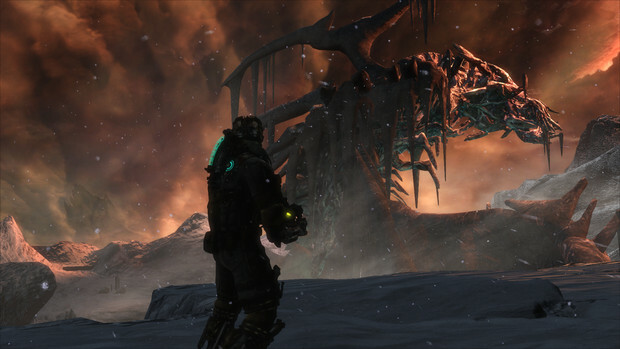 Dead Space 3 follows Alien 3 in spirit if not in location. Both are fine on their own but fail to live up to their impressive predecessors. 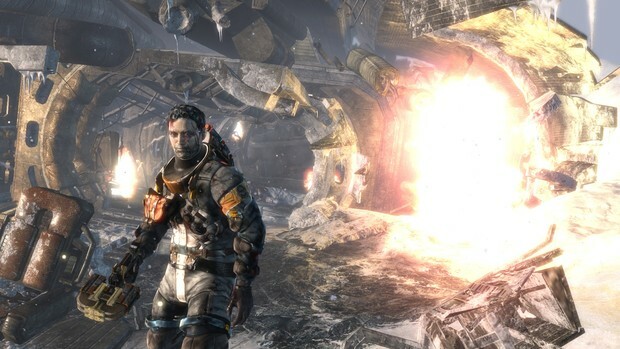 In an attempt to broaden the audience by appealing to the "shooter" crowd, Dead Space 3 places a greater focus on combat, includes human enemies, and implements a rudimentary cover system. The cover system feels especially forced, having not used it once during my entire playthrough aside from messing around with it at the start. Even the weaponry seems to have been changed to appeal to your stereotypical FPS crowd. More "traditional" weapons such as shotguns, carbines, rocket launchers, and SMG's join the hardware-inspired standards of the series like the Plasma Cutter and the Force Gun. While the Pulse Rifle was laughably weak in the first one, the military-inspired firepower you can craft in Dead Space 3 just feels like it outclasses anything else. The series hallmark of strategic dismemberment goes by the wayside when my assault rifle/rocket launcher WonderGun(TM) can blast wave after wave of foes into bits from afar. The once-reliable Line Gun fires too slowly and the iconic Plasma Cutter is just not powerful enough to compete with that kind of firepower. On top of that, Necromorphs come at you much faster and in far greater numbers than before, giving you little time to line up that perfect shot to remove an arm or leg. For a series that used to push the dismemberment angle so fervently it's telling to see it get lost in the action. Thank god I have this double-barreled, acid tipped rocket launcher. That's not to say you can't have a lot of fun with the weapons. Dead Space 3's robust crafting system gives you a lot of ways to customize your loadout to your tastes. Gone is the old grid system of enhancing your guns. Power Nodes and Credits are replaced with a variety of resources which are used to create differing weapon frames, bodies, tips, and support modules. I spent a good chunk of time combining various pieces of equipment to see what insanity I could get. Want a flamethrower with a hydraulic hammer for melee? It's yours. Want a Line Gun that rotates like a Plasma Cutter and can electrocute necromorphs on contact, all the while picking up ammo automatically for you? Well you can have that too. I just wish the balance worked more in favor with the franchise standbys. The Plasma Cutter used to be my bread and butter in the first to installments. Now it just feels like a waste of space. Man, this would be beautiful if the planet weren't trying to kill me. The pacing in the game has some severe issues. 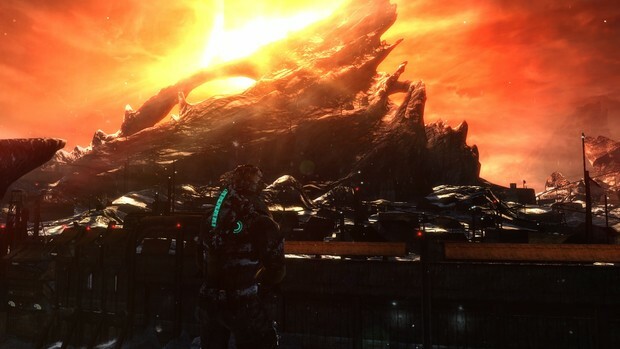 Dead Space 3 starts fast but slows down dramatically in the first few hours. The pace picks back up significantly when you reach the snow-covered planet of Tau Volantis but there is a LOT of backtracking to be had through the game which detracts from the major set pieces. On top of that, most of the side quests are reused layouts from previous missions, dragging out the game and making the out of the way trips seem more annoying than rewarding. Fortunately, you can skip most of the optional content and move from chapter to chapter with little lost beyond a few files and schematics. Don't worry, you won't remember enough about them to care. Back to my Alien comparison for a moment. The first two movies had people I cared about. I can say the names Ash, Bishop, and Hudson and recall their faces, how they acted, and what their roles were. The same holds true for the first two Dead Space games. Nicole Brennen, the insane Nolan Stross, and the omnipresent Director Tiedemann were all memorable. Similar to Alien 3, I can't recall the name of a single non-established character in Dead Space 3 with the exception of the excellently acted Unitologist leader Jacob Davik (voiced by the talented Simon Templeman). They serve little-to-no point other than window dressing and cannon fodder for the plot and the awkwardly forced love triangle drama comes off as unbelievable in this situation. You could make the case that it's caused by a Marker induced psychosis but since no one else, save for when John Carver is controlled by a co-op partner, seems to fall under its influence it seems a tenuous link at best. 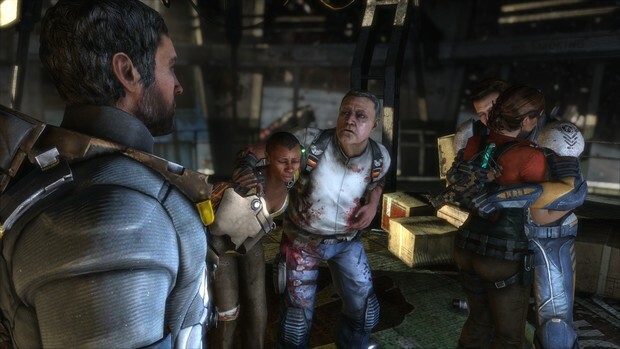 Speaking of John Carver, Dead Space 3 does a fantastic job of mutliplayer this time around. Gone is the tacked on competitive shooter feature from the second game and in it's place is an entertaining and completely optional co-op mode. A second player can join Clarke throughout the campaign and Visceral does a fantastic job of integrating it into the story. Playing with other people almost feels like a completely different game as the dialog is changed to adjust for two players accordingly, rather than just having a silent Carver always standing in the background. None of this pulls away from those who want to journey through the plot alone, however, as save for a few puzzles and the occasional co-op only side mission you would never know the game was tailored for two people to play. This, along the with much maligned inclusion of microtransactions are completely optional and I didn't even notice them past when they are first introduced showing that Visceral took great care to try not to alienate fans with what might be perceived as additions forced on them by publisher EA. Bruised and battered but still willing to fight. Despite my criticisms there is still a lot of entertainment to be had here. Franchise purists might lament the dramatic changes to the core mechanics of the game. Gone is Clarke's insanity, the focus on strategic dismemberment, as well as a lot of the suspense found in the previous two. In it's place is a solid action game with horror overtones that has an excellent cooperative mode which should be played through at least once. Long standing fans have good reason to be upset, but if they can get over the changes there is a fun, albeit flawed, game here. Capitalistpig sleeps with his Plasma Cutter under his pillow waiting for a necromorph to give him a chance to finally use it. You can follow him on Twitter and listen to his podcast GamePoints every Wednesday at 8:30 PST.